Sometimes, life catches up with us. It definitely happens, especially in New York! (They don’t call us the city that never sleeps for no reason.) And when it does, we can start to look worn down and tired. This can lead to dark circles under the eyes. Of course, the best way to eliminate those kinds of dark circles is to get more sleep. However, these dark circles aren’t always caused by lack of sleep. Sometimes they’re caused by simple physiology. These dark circles are much more difficult to address and in some cases require specialized treatment. That’s where a treatment such as non surgical blepharoplasty can really help a patient look and feel more rested. The 15-Minute Non-Surgical Eyelift involves the placement of small amounts of a filler substance in the lower eyelids skin to rejuvenate the lower eyelids. Why Do You Get Dark Circles Under the Eyes? As one ages, the lower eyelids can become hollow. In some people “bags” develop in the lower eyelids which in fact are protruding fat. 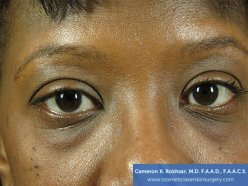 Hollowness or bags around the eyes can be corrected or camouflaged thought the placement of small amounts of a filler substance named Restylane in the lower eyelids. This is a minimal downtime procedure done with numbing cream only and it usually takes less than 15 minutes. The results can last six months to one year. 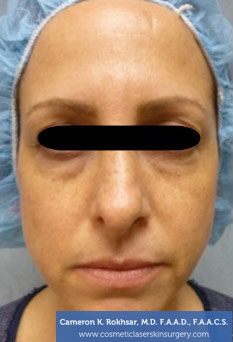 If you have always wanted to improve the appearance of your lower eyelids, get rid of that tired look, decrease the shadowing effect that gives the appearance that you have dark circles around your eyes or improves the appearance of bags around your eyes, and you don’t want surgery, consider the non-surgical eyelift. Dr. Rokhsar can tell you if you are a good candidate for the non-surgical eyelift or whether traditional blepharoplasty would be more suitable for you. 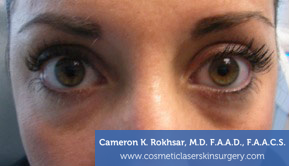 In addition, Dr. Rokhsar can tell you if you can combine the non-surgical eyelift with other laser resurfacing procedures including the CO2 or Fraxel lasers for optimal results. If you want to look more youthful and more rested, then you will want to get started on your non-surgical eyelift today. 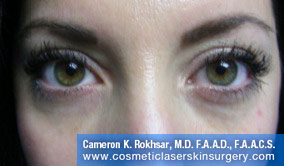 Dr. Rokhsar’s NYC eyelift patients consistently tell us how they feel and look better after the procedure. They even report boosts in self-esteem and self-confidence. In other words, you can look great and feel great. But it all starts with a consultation, during which Dr. Rokhsar will discuss your desired final outcome and the best way to achieve that outcome. If you’re looking for a way to look more youthful and rested without the need for surgery, Non-Surgical Eyelift might be the right way to go. Contact us today to get started on your transformation! Aging causes the skin to lose its elasticity, making it effective for loose skin to be surgically removed and the hollowness underneath the eyes can be restored using Restylane, a cosmetic dermal filler specifically designed to restore volume and fullness to the face. 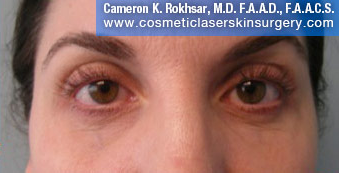 Dr. Rokhsar may also suggest using the Fraxel laser in order to resurface the eyelids to create a smoother appearance. 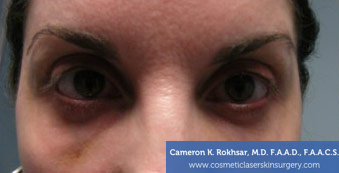 Eyelid rejuvenation treatments are for those who have healthy facial tissue and muscle as well as cosmetic goals advised by Dr. Cameron Rokhsar. After consultation, he will be able to determine what treatments are best for the condition of your eyelids. Will laser surgery be painful? 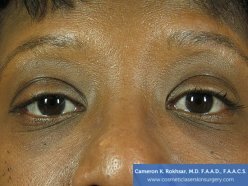 With blepharoplasty surgery, there is certain discomfort, but the anesthesia administered during surgery provides comfortable eyelid procedure. There is little to no pain after the surgery, but the laser treatment provides the patient with minimal discomfort, bruising and shorter recovery time. But otherwise, the non-surgical route gives the patients the luxury of walking out of the office to resume normal activity right afterward. Using a small amount of filler substance to fill in the hollowness around the eye will take about 15-minutes. 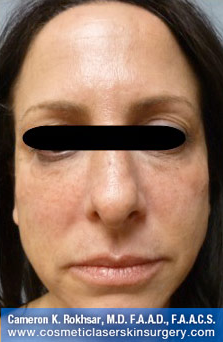 This is a procedure that requires virtually no downtime and can be easily done during a work lunch break depending on an individual’s cosmetic goals. With Restylane injections alone, the patient can resume normal activity immediately. There may be injection site soreness but can be alleviated with Tylenol or cold compress. With surgery, patients will experience some downtime. Fraxel treatments require little to no downtime but in all cases, sun protection and sunglass wearing should be practiced. Depending on which treatment route the patient chose, results can last a few months to a year. With Restylane injections alone, results can last approximately 3 to 6 months.